Muffin, donuts, scones and coffee cake recipes from Distinctive Inns of New England. Do you know the muffin man? He lives in DINEcountry. When it comes to breakfast at any of the 12 Distinctive Inns of New England (DINE), it’s just as often a “muffin woman” preparing the fabulous start to the day that you’ll find. Stay at any of the DINE inns, and your day starts with a homemade and locally-sourced breakfast big enough to fuel you for the day. The complimentary breakfast with your stay at any inn or B&B is one thing that sets this travel option apart from a vacation rental, Airbnb stay or motel. And when it comes to DINE inns, breakfast is a work of art. Perhaps it’s no coincidence that the acronym for Distinctive Inns of New England is DINE. With exceptional breakfasts at the forefront of a DINE inn romantic getaway, we’ve embarked on a series of blog posts sharing recipes from talented innkeepers and chefs at our 12 New England inns. The first in our bucket list of breakfast ideas focused on pancake recipes. The second in our series of bucket list breakfast blogs focused on outside-the-box French Toast recipes. Today, we’re moving on to the best of the breakfast starts with ideas for muffins, donuts, scones and breakfast cakes from DINE innkeepers. Jump start your breakfasts with one of these sumptuous sweets and you’ll be the hero of the kitchen for the rest of the day. Photo Source: Mama’s Southern Cooking. Preheat oven to 375 degrees. Position rack in center of oven. Butter or spray with a non-stick cooking spray 12 muffin cups. Set aside. In a large bowl whisk together eggs, buttermilk, oil, coffee and vanilla. In another bowl combine the flour, cocoa powder, brown sugar, baking powder, baking soda and salt. Stir in the chopped nuts and chocolate chips. With a spatula fold the wet ingredients into dry ingredients and stir only until the ingredients are combined. Do not over mix the batter or tough muffins will result. Evenly fill the muffin cups with the batter, using two spoons or an ice cream scoop. Place in the oven and bake until a toothpick inserted in the center of a muffin comes out clean, about 20 – 25 minutes. Transfer to a wire rack and let cool for about 5 minutes before removing from pan. 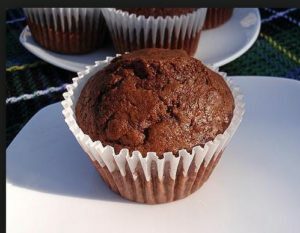 Note: As with any muffin recipe, do not overbeat the batter and put the muffins in the oven immediately after mixing the wet and dry ingredients. Preheat the oven to 375°F. Grease the muffin tins. In a medium bowl, combine the egg, milk, vegetable oil and vanilla extract. Beat in the sour cream, pumpkin and sugar. In a separate large bowl, combine the flour, baking soda, baking powder, salt and five spices. Add the wet ingredients to the dry ingredients, stirring until the flour is just moistened – do not beat. Fold in the chopped pecans (optional). Fill the muffin tins between 1/2 to 2/3 full with the batter. Bake for 20 to 25 minutes, or until a toothpick placed in the middle comes out clean. Cool for 5 minutes. This Donut Muffin recipe yields 24 muffins. Leslie’s Note: Imagine the goodness of homemade donuts and muffins all in one delicious bite. Warning: These donut muffins are addictive and will disappear quickly. So, plan on making double batches, they freeze well. 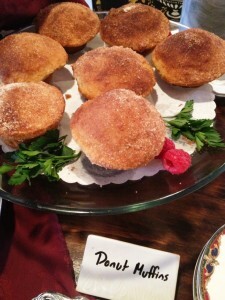 Be sure to check out all the other great recipes in the Rabbit Hill Inn Recipe files. Whisk Using your hands, scoop out batter and fill each muffin to top. While muffins are baking, stir together the topping ingredients. Set aside. When muffins are cool enough to handle, take each muffin and dip tops into melted butter. Dip and swirl into cinnamon/sugar mixture. Coat tops generously. Let sit for a few minutes. Add the eggs and then the cream a little at a time. Do not over moisten the dough. Roll the dough LIGHTLY to a ¾” thickness and use a #3 plain circular edge cutter to shape the scones. Place the scones on a greased cookie sheet and brush them lightly with egg wash (beat the two egg wash ingredients together). Sprinkle a little raw sugar on top. Bake for 15 minutes at 350° until they have risen and are lightly browned. 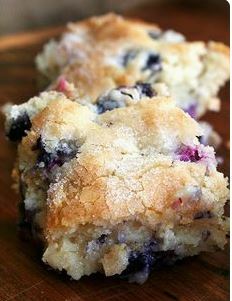 *Note-In Summer, when blueberries are in season and at their best, this is a great recipe to multiply and freeze the finished cakes for later. Preheat oven to 350 Degrees F. Grease & dust with flour a loaf or Bundt pan. In a mixer fitted with a paddle, cream the butter and the sugar. Add the eggs, and mix. Sift together the flour, baking powder & salt. Add the dry ingredients, alternately with the milk, to the butter mixture. Mix completely. Then add in the blueberries, lemon & juice. Stir carefully, so as not to crush the berries. Pour batter into prepared pan. Bake for 50-60 minutes, or until a toothpick inserted in the center comes out clean. Note from Leslie: This homemade glazed raised donut recipe will make you say “Who needs Dunkin’ Donuts or Krispy Kremes? And those gro cery store bought boxed donuts… forget-about-it!” You really can make your own light, airy, delicious raised glazed donuts. Pastry Chef Phyllis is sharing her family doughnut recipe with you (I begged her). In addition to the doughnut recipe, you can watch the “How To Make Donuts” baking video below to see how it’s done. Since you must love great breakfasts, you’ll need to experience at least one at any of the 12 Distinctive Inns of New England. Plan your pampered 2017 getaway at the 12 Distinctive Inns of New England by clicking below on links that will take you directly to each of their websites. This entry was posted in advice, breakfast, Captain's House Inn, Chesterfield Inn, culinary travel, Deerfield Inn, Distinctive Inns of New England, Gateway's Inn, Rabbit Hill Inn, Recipe and tagged 5 spice muffin recipe, 5 spice muffins from Deerfield Inn, blueberry lemon cake recipe, breakfast recipes, breakfasts at New England Inns, Donut Muffin recipe, Donut Muffins from Rabbit Hill Inn, Donut recipes, Lemon Bluebeerry coffee cake from Gateways Inn, Mocha Muffins from Chesterfield Inn, Mocha Muffins recipe, muffin recipes, New England B&Bs breakfast recipes, New England inn breakfast recipes, New England inn muffin recipes, scone recipe, Stollen Scones from Captain's House Inn by DINE Blogger. Bookmark the permalink.